Carlo Ancelotti OSI (Italian pronunciation: [ˈkarlo antʃeˈlɔtti]; born 10 June 1959) is an Italian former professional footballer and current football manager of Napoli. Ancelotti is one of only three managers to have won the UEFA Champions League three times (twice with Milan and once with Real Madrid), and one of only two to have managed teams in four finals. He has won the FIFA Club World Cup twice, managing Milan and Real Madrid. 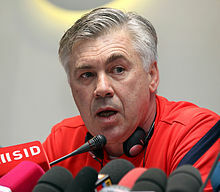 Ancelotti is also one of seven people to have won the European Cup or Champions League as both a player and a manager. He is regarded as one of the best and most successful managers of all time. As a manager, he has worked for Reggiana, Parma, Juventus, Milan, Chelsea, Paris Saint-Germain, Real Madrid and Bayern Munich, and has won domestic titles in Italy, England, France, and Germany. Ancelotti began his career in 1974 with Parma. He made his professional debut in Serie C during the 1976–77 season, at the age of 18. Under manager Cesare Maldini, he was often deployed behind the forwards, or as a second striker, due to his eye for goal. Ancelotti excelled in this role and helped Parma to a second place in the Serie C1 girone A during the 1978–79 season, which qualified the team for the Serie B play-offs. In the decisive match in Vicenza, against Triestina, with the score tied at 1–1, he scored two goals, which gave Parma a 3–1 victory and sealed their place in Serie B the following season. After attracting strong interest from Inter Milan, in mid-1979, Ancelotti transferred to Roma, and made his Serie A debut in a 0–0 draw against Milan on 16 September. Under manager Nils Liedholm, he was deployed as a winger or central midfielder and became one of the club's most important players in a team which featured the likes of Brazilian star midfielder Falcão and Italian footballers Roberto Pruzzo, Bruno Conti and Pietro Vierchowod, immediately winning consecutive Coppa Italia titles in his first two seasons with the club. During his eight seasons at the club, he won the Coppa Italia a total of four times (1980, 1981, 1984, and 1986). After struggling with knee injuries, and managing second- and third-place league finishes in 1981 and 1982, Ancelotti helped lead the team to win a historic Italian championship in 1983, the club's second ever league title in their history. The following season, he even helped Roma to win another Coppa Italia title and reach the European Cup final in 1984, although missed the final through injury as Roma were defeated by Liverpool on penalties at the Stadio Olimpico in Rome. He was named the team's captain in 1985 under new club manager Sven-Göran Eriksson, and served as a mentor to the young midfielder Giuseppe Giannini, as Roma won the Coppa Italia, but once again narrowly missed out on the league title during the 1985–86 Serie A season, finishing in second place behind Juventus. From 1987 until 1992, Ancelotti played for Milan, and was a key part of the successful squad that won the Serie A title in 1988, consecutive European Cups in 1989 and 1990, two European Super Cups, two Intercontinental Cups and a Supercoppa Italiana under manager Arrigo Sacchi. During this time, Milan played with one of their finest teams ever assembled in that decade under the financial backing of club president Silvio Berlusconi, with Paolo Maldini, Franco Baresi, Mauro Tassotti and Alessandro Costacurta as defenders; Frank Rijkaard, Ruud Gullit and Roberto Donadoni as midfielders; and Marco van Basten upfront. One of Ancelotti's most memorable moments with Milan was when he received a pass from Ruud Gullit, dribbled around two Real Madrid players and netted a powerful long-range shot during the Rossoneri's 5–0 thrashing of Real Madrid in the 1989 European Cup semi-finals. He went on to play all 90 minutes in Milan's 4–0 dismantling of Steaua București in the final. 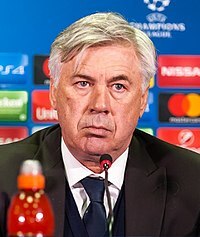 The following season, Ancelotti suffered an injury to his left knee in the quarter-finals of the European Cup against KV Mechelen which forced him to miss the semi-finals, although he was able to return in time to help Milan defend their title against Benfica in the final, held in Vienna. Following Sacchi's departure, he won a second Serie A title under replacement manager Fabio Capello during the 1991–92 Serie A season, as Milan won the title undefeated, but persistent knee injuries and competition from youngster Demetrio Albertini limited his playing time, and eventually forced him into premature retirement at the end of the season, at the age of 33. He played the final match of his career with the club in a 4–0 home win over Hellas Verona on 17 May 1992, in which he came off the bench in the final 20 minutes of the game and scored two goals, and was given an ovation by the fans. Under manager Enzo Bearzot, Ancelotti made his Italy national team debut and scored his first and only goal on 6 January 1981 in a one-off tournament against the Netherlands, which ended in a 1–1 draw. He was very likely to be capped for the 1982 World Cup campaign, but a dramatic knee injury forced him away for several months, as Italy went on to win the tournament without him. He was a part of Italy's World Cup squad in the 1986 World Cup, where he did not make a single appearance, however, as both he and Paolo Rossi struggled during the team's fitness tests, due to the altitude of the region, and were replaced in the starting line-up by Fernando De Napoli and Giuseppe Galderisi respectively. Under new Italy manager Azeglio Vicini, he was also a key member of the Italy squad that reached the semi-finals of UEFA Euro 1988, and was also set to represent his nation at the Summer Olympics in Seoul that summer. An injury to the meniscus of his right knee, however, prevented him from taking part in the tournament, where Italy ultimately managed a fourth-place finish. Ancelotti later went on to play in the 1990 World Cup on home soil under Vicini at the age of 31, although an injury in the second group match against Austria once again limited his appearances in the competition to just three, and kept him on the sidelines until the third-place final against England, in which he returned to help Italy to a 2–1 win. Ancelotti made a total of 26 performances for the Italian national side, and announced his retirement from international football in 1991, making his final Italy appearance under Arrigo Sacchi. A world-class player, Ancelotti was a creative, cautious, and efficient midfielder who was known for his leadership, skill, composure on the ball, and organisational ability; he is regarded as one of the best Italian midfielders of his generation. Although he lacked pace, as well as notable physical and athletic characteristics, he was a highly talented, yet hard-working, combative, and tenacious team-player, who was competent defensively, but who above all possessed excellent technical ability, tactical intelligence, vision and passing range, as well as a powerful and accurate shot from outside the area; his wide range of skills enabled him to contribute to his team's offensive play with goals and assists. A versatile midfielder, he was capable of being deployed in several positions: while he was usually deployed as a playmaker in the centre of the pitch during his time with Milan under Arrigo Sacchi, he often played on the wings during his time with Roma, and was also capable of playing as an attacking midfielder, or even in a box-to-box role; in his youth, he was often deployed in a more advanced role as a forward, usually as a second striker. As with Milan he was often deployed in front of the back-line, as a central or defensive midfielder, a position which allowed him to set the tempo of his team's play after winning back possession, he is regarded as having been the mentor and predecessor of Demetrio Albertini and Andrea Pirlo in the deep-lying playmaking role at the club. Despite his ability, his career was affected by several injuries, which limited his playing time, and forced him into retirement in 1992. Ancelotti undertook his coaching studies at Coverciano, where he penned a research article entitled "Il Futuro del Calcio: Più Dinamicità" (English: "The Future of Football: More Dynamism"). After serving as an assistant manager with the Italy national team under his former Milan coach Arrigo Sacchi between 1992 and 1995, and reaching the 1994 World Cup final, Ancelotti began his managerial career with Serie B side Reggiana in 1995, where he immediately aided the team in achieving promotion to Serie A; he left after the 1995–96 Serie B season, finishing with a record of 17 wins, 14 draws, and 10 losses in his only season with the club. "I said, ‘No, you have to play striker.’ Baggio went to another club. That year Baggio scored 25 [actually 22] goals – for Bologna! I lost 25 goals! Big mistake." —Carlo Ancelotti talking to Simon Kuper of the Financial Times in 2014, reminiscing his regret on choosing a system over Roberto Baggio during his time as Parma's manager. Ancelotti joined Parma the following season, a team which had recently enjoyed several years of domestic and European success under the previous manager Nevio Scala, and which contained several promising young players, including future Italy stars Gianluigi Buffon and Fabio Cannavaro. Ancelotti made his debut in the Coppa Italia in a 3–1 loss to Pescara. Ancelotti made several changes at the club, implementing a rigorous Sacchi-inspired 4–4–2 formation, and initially deploying creative forward Gianfranco Zola out of position on the left wing in order to accommodate Hristo Stoichkov up-front, although both players were later eventually sold by the club after lack of playing time due to struggling to perform in this system. With the new attacking partnership of Enrico Chiesa and Hernán Crespo, Parma finished second in Serie A during the 1996–97 season under Ancelotti, which guaranteed them a place in the next edition of the UEFA Champions League. The following season, the club had agreed to sign another Italian creative forward, Roberto Baggio, but Ancelotti impeded the transfer as he once again did not feel that a player like Baggio would fit into his tactical plans. Ancelotti later stated that he regretted this decision, stating that at the time he believed that the 4–4–2 was the ideal formation for success, and that offensive playmakers were not compatible with this system. After suffering a first round elimination in the 1997–98 Champions League, and a semi–final appearance in the Coppa Italia, Ancelotti was only able to guide Parma to a sixth-place finish in Serie A during the 1997–98 season, and was sacked at the end of the season, despite qualifying the team for next season's UEFA Cup. In February 1999, Ancelotti was appointed Juventus manager, where he both succeeded and preceded Marcello Lippi, who returned to the club when Ancelotti left. With Juventus, Ancelotti became less rigorous with the team's formation, abandoning his favoured 4–4–2 in order to accommodate star French playmaker Zinedine Zidane in his preferred free role behind the forwards in the team's starting line-up. His first full season at Juventus began promisingly, as he immediately won the Intertoto Cup with the club by beating Rennes 4–2 on aggregate, although Juventus suffered a round of 16 elimination in the UEFA Cup, and lost the league title to Lazio by a single point on the final match-day of the season; this was after surrendering a five-point lead with three games remaining, which drew strong criticism from the fans and the board of directors. The following season, Ancelotti went trophyless, finishing runner-up in Serie A yet again, to Roma, and he was sacked by Juventus. Ancelotti's dismissal was announced by Juventus at half-time in the final league game of the season at home against Atalanta, on 17 June 2001, even though they were still within a chance of winning the title; Juventus won the match 2–1, although the result was not enough to prevent them from finishing behind Roma in the league. Ancelotti finished his tenure with Juventus with a record of 63 wins, 33 draws and 18 losses. Ancelotti was appointed Milan manager on 5 November 2001, after Fatih Terim was sacked due to poor results. He was inheriting another recently trophyless team in Milan, as the Rossoneri had floundered domestically and in Europe since their last Scudetto victory in 1999. In the 2001–02 season, Ancelotti led Milan to qualify for the Champions League once again, as the team managed a fourth-place finish in Serie A, and also reached semi-finals of the UEFA Cup, their best ever finish in the competition, losing out to Borussia Dortmund, and also suffered a semi-final elimination in the Coppa Italia to Juventus. The following season, Ancelotti - who was heavily criticised by club owner Silvio Berlusconi due to his supposedly defensive tactics - was able to adopt a creative play in Milan while making several changes to the team's squad. He made Dida - still maligned for his 2000–01 Champions League howler against Leeds United - his new starting goalkeeper barely a month into the season, while converting budding attacking midfielder Andrea Pirlo to a defensive midfielder, playing him behind the number 10 (either Rui Costa or Rivaldo) in front of the team's back-line as a deep-lying playmaker in a 4–3–1–2 or 4–1–2–1–2 formation. At the same time, Filippo Inzaghi and Andriy Shevchenko proved to be dominant and dynamic strikers, who were prolific in front of goal. Milan won the 2003 Champions League final, beating Juventus 3–2 on penalties at Old Trafford, and also won the 2003 Coppa Italia Final over Roma. It was a sweet revenge for him as Juventus had brutally sacked him and to add insult, Marcello Lippi was re-hired for a second tenure and won back-to-back Serie A titles. The following season, with the addition of Brazilian attacking midfielder Kaká, and Ancelotti's formidable four-man back-line of Cafu, Costacurta, Alessandro Nesta and Maldini, Milan took home the UEFA Super Cup in 2003 over Porto, followed by the Scudetto in 2004 with an Italian record of 82 points from 34 games, while Shevchenko finished the season as the league's top-scorer. The Rossoneri, however, suffered penalty-shootout defeats to Juventus in the 2003 Supercoppa Italiana, and to Boca Juniors in the 2003 Intercontinental Cup. They were also knocked out by Deportivo de La Coruña in the 2003–04 UEFA Champions League. Under Ancelotti's reign, Milan also won the 2004 Supercoppa Italiana, and were also back-to-back Serie A runners-up to Juventus in 2004–05 and 2005–06 (both Scudetti were later wiped from the record books of Juventus due to the club's involvement in the Calciopoli scandal). During the 2004–05 season, Ancelotti also led Milan to the 2005 Champions League final, where they lost out to Liverpool 2–3 on penalties after a 3–3 draw in normal time. In the Coppa Italia, the team was unable to get past the quarter finals. The following season, Milan once again faced disappointment as they lost out to Barcelona in the Champions League semi-finals, and only reached the quarterfinals of the Coppa Italia. After the departure of striker Andriy Shevchenko at the beginning of the 2006–07 season, Ancelotti was forced to redesign Milan's line-up once again, devising a 4–3–2–1 system that would later be known as his "Christmas Tree" formation. Milan's line-up used Inzaghi as a lone striker, supported by attacking midfielders Clarence Seedorf and Kaká, in front of a three-man midfield which featured Andrea Pirlo as a creative playmaker, supported by hard-working defensive midfielders Gennaro Gattuso and Massimo Ambrosini. Milan received an eight-point deduction during the 2006–07 Serie A season for their role in the Calciopoli scandal, which virtually put the team out of the title race, and instead led Ancelotti to focus on winning the Champions League. On 23 May 2007, Milan avenged their defeat to Liverpool two years earlier with a 2–1 win at the Olympic Stadium in Athens in the 2007 Champions League final, leading to Ancelotti's second Champions League trophy as Milan coach and his fourth title overall, having also won it twice as a Milan player in 1989 and 1990. During the 2006–07 season, Milan also finished fourth in Serie A, and lost out to eventual champions Roma in the Coppa Italia semi-final. The next season, Ancelotti also won the 2007 UEFA Super Cup, as well as the club's first ever FIFA Club World Cup in 2007, becoming the first manager to do so with a European side. After finishing the league in fifth place, Milan missed out on Champions League qualification, and also suffered round of 16 eliminations in the Champions League and Coppa Italia (to Arsenal and Catania respectively). In Ancelotti's final season at the club, Milan managed a third-place finish in Serie A behind Juventus and cross-city rivals Inter, sealing a place in the next season's Champions League, while they were eliminated in the round of 32 of the UEFA Cup, and the round of 16 of the Coppa Italia. After previously denying rumours that he would be leaving the club, on 31 May 2009 Ancelotti announced his resignation from Milan - less than an hour after their 2–0 victory over Fiorentina in the final match of the season. In total, Ancelotti led Milan for 423 games; only Nereo Rocco has been in charge of the club for more matches. On 1 June 2009, Ancelotti succeeded interim manager Guus Hiddink when he was confirmed as the new Chelsea manager after agreeing to a three-year contract, and formally assumed his duties on 1 July. His salary at Chelsea was initially reported to be more than £5 million per year. Ancelotti became the club's fourth permanent manager in 21 months, following José Mourinho, Avram Grant and Luiz Felipe Scolari. He was also the third Italian to manage Chelsea, after Gianluca Vialli and Claudio Ranieri. On 9 August 2009, Ancelotti won his first trophy as Chelsea manager, the Community Shield, beating Manchester United on penalties, following a 2–2 draw. His first Premier League game in charge of the Blues ended in a 2–1 home victory over Hull City on 15 August 2009. Chelsea lost their first match under Ancelotti at the DW Stadium away to Wigan Athletic on 26 September, losing 1–3. They were eliminated from the League Cup on 2 December, reaching the quarter-finals stage, after a penalty shootout defeat to Blackburn Rovers after a 3–3 draw at Ewood Park. In the Champions League, Ancelotti returned to the San Siro for the first time since his departure from Milan, when his team faced Inter Milan, who was at the time coached by ex-Chelsea manager José Mourinho, at the Round of 16 stage. Ancelotti and Mourinho had a tense relationship from the previous season, as managers of Milan and Inter respectively. Chelsea was eliminated from the Champions League on 16 March 2010 after a 1–3 aggregate loss to Inter, having lost 1–2 away and 0–1 at Stamford Bridge. On 9 May 2010, Ancelotti led Chelsea to the Premier League title, beating Manchester United by one point and setting scoring records. The team finished the campaign with 103 goals, becoming the first team in the Premier League to score more than 100 goals in a season, and the first since Tottenham Hotspur in the 1962–63 season. Chelsea secured the title with an 8–0 victory over Wigan at Stamford Bridge. Ancelotti also became the first Italian manager to win the Premier League and only the fifth manager overall in the League's 18 seasons. On 15 May 2010, Ancelotti led Chelsea to victory in the 2009–10 FA Cup, beating Portsmouth 1–0 in the final at Wembley Stadium; Chelsea's third victory in the FA Cup in four years, equaling a record set by Arsenal between 2002 and 2005. The FA Cup win secured Chelsea's first ever domestic double. The following season, after having lost to Manchester United in the 2010 FA Community Shield in August, Ancelotti led Chelsea to the top of the table on the first weekend of the season thanks to a 6–0 rout of newly promoted West Bromwich Albion. Chelsea followed up this result with another 6–0 win, this time over Wigan, while Stoke City were beaten 2–0 in the next match. Chelsea had a good start to the season, winning their first five matches. Chelsea then lost 3–4 against Newcastle United on 23 September 2010 in the League Cup. They then went on to lose against Manchester City in the Premier League 0–1 after a cleverly-taken strike by City captain Carlos Tevez. Chelsea made a good start in Europe by beating MŠK Žilina and Marseille 4–1 and 2–0, respectively, in the 2010–11 UEFA Champions League. Chelsea then defeated fourth-placed Arsenal 2–0 on 3 October 2010, courtesy of a goal from Didier Drogba and a free-kick by defender Alex. Chelsea's next defeat of the season came against Liverpool at Anfield on 7 November 2010, where they lost 0–2 with both goals coming from Fernando Torres. A week later, Chelsea suffered their second Premier League defeat in three matches with a remarkable 0–3 home defeat to Sunderland. In their following five league games, they lost two and drew three games, culminating in a 1–3 loss to Arsenal at the Emirates Stadium. On 5 January 2011, Chelsea suffered a shock 0–1 defeat at struggling Wolverhampton Wanderers, leaving them fifth in the League and in real danger of missing out on a Champions League place for the first time since 2002. This result led to Ancelotti ruling out Chelsea's chances of retaining the title, insisting that he did not fear that he would be sacked. But after this match, however, Chelsea's form began to improve. First with a 7–0 thrashing of Ipswich Town in the FA Cup at Stamford Bridge and then a 2–0 victory over Blackburn, followed by emphatic away wins against Bolton Wanderers and Sunderland, putting them in fourth position in the league, though still ten points behind leaders Manchester United. On 31 January 2011, Chelsea signed Liverpool striker Fernando Torres for a British record £50 million and Benfica defender David Luiz for £22 million. Chelsea lost 0–1 to Liverpool at Stamford Bridge but beat league leaders Manchester United on 1 March in a 2–1 comeback win that saw David Luiz net his first goal for Chelsea, which was followed by a 3–1 win away to Blackpool. Chelsea were later defeated by Manchester United at home and away (aggregate of 1–3) in the Champions League quarter-finals. Following their defeat in the Champions League, Chelsea made a remarkable comeback in the league, defeating Wigan 1–0 at home, West Brom 3–1 away, Birmingham City 3–1, West Ham United 3–0 and Tottenham 2–1 at home. Chelsea, who at one point were fifth and 15 points behind leaders Manchester United, vaulted into the second position the league, just three points behind them with three games left of the season. On 8 May, however, Chelsea lost 1–2 against Manchester United at Old Trafford to stay second in the league, now six points behind the leaders with just two more games to play. Ancelotti was sacked less than two hours after a 0–1 away defeat against Everton on 22 May 2011, Chelsea's last Premier League match of the season. They had finished the 2010–11 Premier League in second place. He was earning £6.5 million per year at Chelsea just before his departure from the club. He reportedly received a severance payment of £6 million from Chelsea. Ancelotti finished with a record of 67 wins, 20 draws and 22 losses in 109 matches. Ancelotti's win percentage at Chelsea is the third-highest in Premier League history, behind only José Mourinho and Sir Alex Ferguson. On 30 December 2011, with Paris Saint-Germain at the top of the Ligue 1 with three points down to Montpellier, Ancelotti was appointed as the new manager of the club on the same day as their previous manager, Antoine Kombouaré, was released from his contract. His salary at PSG was reported to be €6 million per year. On 21 March 2012, Ancelotti experienced his first defeat in charge of PSG as the club fell to a 1–3 defeat at the hands of Lyon in a Coupe de France quarter-final match. Ten days later, PSG suffered their first Ligue 1 defeat under Ancelotti when they lost 1–2 away to Nancy. PSG ended up as runners-up in Ligue 1 in Ancelotti's first season in charge, three points behind winners Montpellier. He also took PSG to the Coupe de France quarter-finals. The club were eliminated from the Coupe de la Ligue and UEFA Europa League prior to Ancelotti's appointment. During Ancelotti's first full season at the club, PSG entered the winter break at the top of the Ligue 1 table ahead of Lyon and Marseille on goal difference. They clinched the Ligue 1 title on 12 May 2013 with two matches to spare. The club reached the quarter-final of the Champions League, where they lost to Barcelona on the away goals rule (3–3 on aggregate), the quarter–final of the Coupe de France and the quarter–final of the Coupe de la Ligue. On 19 May 2013, Ancelotti asked to leave the club, then joined Real Madrid. Ancelotti posing with the European Champion Clubs' Cup after Real Madrid won the UEFA Champions League on 24 May 2014. On 25 June 2013, Ancelotti became the manager of Real Madrid as the replacement for the departing José Mourinho, signing a three-year deal. He was introduced at a press conference at the Santiago Bernabéu Stadium, where it was also announced that Zinedine Zidane and Paul Clement would be his assistant coaches. Shortly following his arrival, Real Madrid confirmed the signing of Isco for a fee of €24 million which was followed by the signing of Asier Illarramendi for €32 million. Argentinean striker Gonzalo Higuaín left the club for €40 million to Napoli. This, along with the sale of Mesut Özil to Arsenal, paved way for new world record signing Gareth Bale for £86 million (€105M) from Tottenham Hotspur. In Ancelotti's first league game in charge, on 18 August 2013, Real Madrid won 2–1 at home against Real Betis. At Real Madrid, Ancelotti eventually deviated from the 4–2–3–1 formation which had been deployed by his predecessor, switching instead to a 4–3–3 formation to great effect, in which Argentine winger Ángel Di María particularly excelled as a left-sided central midfielder, and played a key role in the club's successes. On 16 April 2014, Ancelotti won his first major trophy as Real Madrid manager after they defeated Barcelona 2–1 in the Copa del Rey final held at the Mestalla Stadium. On 29 April, Real Madrid defeated Bayern Munich in the semi-finals of the Champions League by an aggregate score of 5–0 (1–0 in Madrid and 0–4 in Munich), with Los Blancos reaching their first final since they last won the competition in 2002. On 24 May, Real Madrid won their tenth Champions League trophy after defeating Atlético Madrid in the final 4–1 in extra time. He became only the second manager after Liverpool's Bob Paisley to win the competition on three occasions and the first man to win the Champions League/European Cup twice as a player and three times as a manager to this day. In addition to winning the Champions League, they finished third in La Liga, losing the tiebreaker for second place against Barcelona, and winning Copa del Rey. On 12 August, Ancelotti won another European trophy, leading Real Madrid to a 2–0 victory over Sevilla in the 2014 UEFA Super Cup. In the last four months of 2014, his team set a Spanish record of 22 consecutive match victories in all competitions that began on 16 September and culminated with Real Madrid's first FIFA Club World Cup title in December 2014, finishing the year 2014 with four trophies. By securing only a third-place finish for the 2013–14 La Liga season, he became the first Real Madrid manager to finish outside the top two of La Liga since the 2003–04 season, and also the first Real Madrid manager to finish behind city rivals Atlético since the 1995–96 season. On 1 December 2014, Ancelotti was nominated as one of the three finalists for the 2014 FIFA World Coach of the Year Award. On 19 January 2015, Ancelotti was inducted into the Italian Football Hall of Fame and on 20 January 2015, he won the IFFHS 2014 Award as The World's Best Club Coach. Real Madrid finished the 2014–15 league season in second place, scoring 118 goals in the process. They were eliminated in the round of 16 in the Copa del Rey. On 25 May 2015, Real Madrid president Florentino Pérez announced that the club's board had taken "a very difficult decision" to relieve Ancelotti of his duties with immediate effect. Pérez stated that Ancelotti had won the hearts of both the board and fans, and would always have a place in the club's history because he was the coach that led them to the Décima. "However at this club the demands are huge and we need a new impulse in order to win trophies and be at our best," he added. After leaving Madrid, Ancelotti held talks about a return to Milan, which he rejected, saying, "It was hard to say no to such a beloved club to me, but I need some rest. I wish them the best." He stated that he wanted to take a year off and undergo an operation for his spinal stenosis. He later relocated to Vancouver, Canada. On 20 December 2015, Bayern Munich CEO Karl-Heinz Rummenigge confirmed that Ancelotti would replace Pep Guardiola as manager for the 2016–17 season, signing a three-year contract. His contract started on 1 July 2016. His first training session was on 11 July 2016 and his first match was a pre–season win against SV Lippstadt 08. His first match at Allianz Arena was a 1–0 pre–season win over his predecessor Guardiolas's Manchester City. Bayern participated in the International Champions Cup. In the first match, Bayern lost to Milan in a shootout. In the second match, Bayern defeated Inter Milan. In the final match, Bayern lost to Real Madrid. On 14 August 2016, Bayern defeated Borussia Dortmund 2–0 in the German Super Cup. This was his first trophy as Bayern's manager. On 26 August 2016, in his Bundesliga debut, Bayern defeated Werder Bremen 6–0. In addition to defeating Borussia Dortmund, Carl Zeiss Jena, and Werder Bremen, they defeated Schalke 04, Rostov, Ingolstadt 04, Hertha BSC, and Hamburger SV to win his first eight matches as head coach before losing to Atlético Madrid. They continued their winless streak against 1. FC Köln and Eintracht Frankfurt before defeating PSV Eindhoven. After the win against Eindhoven, Bayern went on a three match winless streak. Bayern drew against 1899 Hoffenheim and lost against Borussia Dortmund and Rostov before defeating Bayer Leverkusen. On 29 April, Ancelotti led Bayern to their fifth consecutive Bundesliga title and their 27th overall following a 6–0 away win over Wolfsburg. However, Bayern were eliminated in the Champions League in a controversial quarter-final clash against Ancelotti's former team Real Madrid. They also lost 3–2 to Borussia Dortmund in the DFB-Pokal semi-finals. On 5 August 2017, Ancelotti started the 2017–18 season with Bayern Munich by retaining the DFL-Supercup, beating out Borussia Dortmund 5–4 on penalties, following a 2–2 draw after 90 minutes; this was the sixth time that Bayern had managed to win the title. However, on 28 September 2017, Ancelotti was sacked as manager of Bayern Munich, following a 3–0 away loss to Paris Saint-Germain in the club's second group match of the 2017–18 Champions League the night before. After the Paris Saint-Germain match, reports surfaced that Ancelotti had lost the dressing room. It was reported that five senior players wanted Ancelotti out as manager which Bayern's president Uli Hoeneß later confirmed. Questions were also raised about Ancelotti's tactical setup and team selection against Paris Saint-Germain when he left several key players on the bench and one was left to watch the match from the stands. On 23 May 2018, Ancelotti was appointed as coach of Napoli, signing a three-year contract, replacing Maurizio Sarri in the role. On 19 August, he made his return to the Serie A and won his first game in charge with a 2–1 away victory over Lazio. On 3 September, Ancelotti suffered his first defeat as Napoli manager as his side lost 3–0 to U.C. Sampdoria. Ancelotti coaching his players from the technical area in November 2012. Towards the beginning of his coaching career, and during his time with Parma, Ancelotti preferred to use a rigorous 4–4–2 formation, which made use of heavy pressing, and drew influence from that of his Milan and Italy coach Arrigo Sacchi, and which he believed to be the most successful system for his team; however, this system did not allow for more creative forwards, such as Gianfranco Zola, Hristo Stoichkov and Roberto Baggio, to play in their preferred positions, and ultimately led to Zola and Stoichkov's departure from the club, while Baggio's transfer to Parma in 1997 was impeded by Ancelotti. Ancelotti later stated that he regretted his intransigence, and when he joined Juventus, he abandoned his favoured 4–4–2 in order to accommodate Zinedine Zidane in his preferred advanced playmaking role behind the forwards. In addition to Sacchi, Ancelotti has also cited his former Roma manager Nils Liedholm, and his youth coach Bruno Mora as major influences. Despite his initial reputation as a tactically inflexible coach, with Milan Ancelotti later drew praise for his ability to find systems which would best suit his players, and which allowed several talented and creative players to co-exist; under Ancelotti's management, the club enjoyed one of its most fruitful spells in its history. Carlo Ancelotti's Milan sides usually almost always used a strong four-man back-line, a main striker and an attacking midfielder. In his first seasons with the club, although he was initially criticised by the club's president Berlusconi, due to his supposedly defensive tactics, Ancelotti was able to implement a more creative playing style based on possession when he notably adopted a 4–3–1–2, 4–1–2–1–2 or 4–4–2 diamond formation. While still preserving the team's strong defensive line, Ancelotti converted attacking midfielder Andrea Pirlo to a deep-lying playmaker, which saw him play in a seemingly defensive midfield role in front of the back-line, and behind the team's advanced playmaker, either Rui Costa or Rivaldo, giving the Italian more time on the ball to orchestrate the team's attacking moves from deeper areas, or to create goalscoring opportunities for the team's prolific strikers with his accurate long passing ability; the team's two playmakers were supported defensively by box-to-box midfielders on either side of them in the midfield diamond. Due to competition from Alessandro Nesta, Paolo Maldini, Roque Júnior, Dario Šimić, and later Jaap Stam in defence, he also converted former centre-back Alessandro Costacurta to a defensive left-back, alternating him with Kakha Kaladze or Giuseppe Pancaro, while, due to the club's narrow midfield, the club's attacking right-back, Cafu, was given license to attack and provide width to the team; due to Cafu's offensive capabilities, Ancelotti occasionally fielded a 4–4–1–1 or 3–4–1–2 formation, which saw Cafu used as an outright winger, along with Serginho or Marek Jankulovski on the left. After the departure of one of the club's main strikers at the beginning of the 2006–07 season, Andriy Shevchenko, Ancelotti redesigned Milan's line-up, devising a 4–3–2–1 system, later known as his "Christmas Tree" formation. Milan's line-up used either Filippo Inzaghi or Alberto Gilardino as a lone striker, supported by two attacking midfielders, Clarence Seedorf and Kaká, in front of a three-man midfield which once again featured Andrea Pirlo as a deep-lying playmaker, supported by two hard-working defensive midfielders, such as Gennaro Gattuso, Massimo Ambrosini, or Cristian Brocchi. At Real Madrid, Ancelotti similarly drew praise for his versatility; he modified the team's 4–2–3–1 formation, which had been used under José Mourinho, to a 4–4–2 formation, before settling on a 4–3–3 formation, in which Argentine former winger Ángel Di María was converted to a left-sided central midfielder, while Cristiano Ronaldo was played in his preferred free role on the left wing. Di María particularly excelled in this new role and played a key role in the club's successes. In addition to his tactical prowess and adaptability, Ancelotti has also drawn praise for his kindness, good humour, and his calm, balanced approach as a manager, as well as his ability to motivate his players and cultivate a good relationship with them, and foster a united, winning team environment, although he has also been known to lose his temper at times. During Ancelotti's first season with Bayern Munich, Spanish midfielder Thiago praised Ancelotti for the freedom he gave the players to express themselves and for the confidence with which he instilled them; Ancelotti commented on the tactical changes he implemented at Bayern Munich, stating "[t]he main change is we press a bit more intermittently and we try to play more directly, more vertically," also adding that "if you're organised even an ordinary player can do very well because he'll have options and he'll know where they are and how to find them. But when you get to the final third, everything changes. That's where you need creativity and freedom because without it you only have sterile possession. Especially if your opponent's defence is organised and has been paying attention." Ancelotti has two children: a daughter, Katia; and a son, Davide, who also played in the Milan youth team and later joined Borgomanero in June 2008. In 2008, Ancelotti confirmed in an interview that he had broken up with his wife of 25 years, Luisa Gibellini. Then he dated Marina Cretu. In 2011, it was announced he was dating Canadian businesswoman Mariann Barrena McClay. Ancelotti and Barrena McClay married in Vancouver in July 2014. In May 2009, Ancelotti's autobiography, Preferisco la Coppa ("I Prefer the Cup", with a word-play by Ancelotti on the Italian word "coppa" that stands both for "cup" and a type of cured cold pork meat cut, which is produced in Ancelotti's native region of Emilia-Romagna), was published, with all proceeds from sales of the book going to the Fondazione Stefano Borgonovo for the funding of research on amyotrophic lateral sclerosis. In his last season with Chelsea, Ancelotti had to travel back to Italy on a regular basis to visit his 87-year-old father who was in poor health with diabetes and other issues. On the issue, he said, "I don't have a problem managing the team for this reason. It's difficult, emotionally, when it's your father... but this is life. I have to do my best to stay close to him, but this is the life." His father died on 29 September 2010, aged 87. On 31 January 2019, Carlo Ancelotti became the grandfather of twins, Lucas and Leon, born by Ana Galocha, partner of his son Davide. ^ a b c "Ancelotti: Carlo Ancelotti: Manager". BDFutbol. Retrieved 28 December 2017. ^ "Carlo Ancelot". SSC Napoli (in Italian). Retrieved 2 November 2018. ^ "Carlo Ancelotti official on Instagram: "Oggi ho ricevuto l'onorificenza di Ufficiale dell'Ordine della Stella d'Italia dalle mani del mio amico ambasciatore Pietro Sebastiani. Un…"". Instagram. Retrieved 10 February 2016. ^ FIFA.com (17 December 2007). "AC Milan do Europe proud". Retrieved 24 May 2017. ^ Hayward, Paul (25 May 2015). "Champions League final 2014: Carlo Ancelotti proves he is greatest manager in Europe after Real Madrid's victory". telegraph.co.uk. The Telegraph. Retrieved 20 December 2015. ^ "Del Piero: "Ancelotti is the best manager of all time"". marca.com. Marca. 29 July 2014. Retrieved 26 March 2015. ^ Todd, Oliver (21 March 2015). "David Beckham urges Real Madrid to keep faith in Carlo Ancelotti, labelling the Italian as one of the best managers in the world". dailymail.co.uk. Daily Mail. Retrieved 20 December 2015. ^ Kidd, Dave (26 May 2014). "Carlo Ancelotti's third European Cup means he joins Bob Paisley in the unsung hero hall of fame". mirror.co.uk. Mirror. Retrieved 20 December 2015. ^ Andrea Schianchi (29 April 2017). "Bayern, Ancelotti è il re d'Europa: ha vinto grandi titoli in 5 Paesi diversi" (in Italian). La Gazzetta dello Sport. Retrieved 18 June 2017. ^ a b c d e f g h i j k l m n "A.C. Milan Hall of Fame: Carlo Ancelotti". acmilan.com. A.C. Milan. Retrieved 21 December 2015. ^ a b c d e f g h i j k l m n o p "Carlo Ancelotti". Storie di Calcio (in Italian). Retrieved 20 December 2015. ^ a b c d "Ancelotti, Carlo". treccani.it (in Italian). Retrieved 9 June 2016. ^ a b c d e f g h i j "Carlo Ancelotti" (in Italian). magliarossonera.it. Retrieved 11 May 2017. ^ a b c d e f g h i j k Alberto Costa. "ANCELOTTI, Carlo". treccani.it (in Italian). Retrieved 9 June 2016. ^ Marlow, Matt (5 November 2010). "Carlo Ancelotti: Steven Gerrard would be a dream to manage". Daily Mail. Retrieved 20 December 2015. ^ Paolo Menicucci (4 July 2015). "The greatest teams of all time: AC Milan 1988-90". UEFA.com. Retrieved 9 March 2016. ^ a b c d e "Carlo Ancelotti factfile: the road to Chelsea". The Guardian. 1 June 2009. Retrieved 10 June 2016. ^ "Mondiali 1986: ARGENTINA, Capitolo III – Si ricomincia con la Bulgaria" (in Italian). Storie di Calcio. Retrieved 28 September 2017. ^ a b Jonathan Wilson (22 April 2009). "The Question: is the box-to-box midfielder dead?". The Guardian. Retrieved 15 January 2018. ^ "ALBERTINI, Demetrio". treccani.it (in Italian). Retrieved 20 December 2015. ^ EMILIO MARRESE (22 December 1996). "PAURA ANCELOTTI DAVANTI AL MAESTRO" (in Italian). La Repubblica. Retrieved 11 May 2017. ^ LICIA GRANELLO (18 June 1991). "LENTINI, L' ULTIMO ACQUISTO" (in Italian). La Repubblica. Retrieved 9 December 2017. ^ Roan, Dan (18 May 2010). "England learn from Italy's national training centre". BBC Sport. Retrieved 18 May 2010. ^ a b c d "AC Reggiana » Manager history". World Football. Retrieved 13 June 2016. ^ a b "AC Reggiana » Fixtures & Results 1995/1996". World Football. Retrieved 13 June 2016. ^ a b Wiltse, Matt (1 April 2017). "How Zidane's experience in Italy shaped his coaching philosophy". Managing Madrid. Retrieved 4 April 2017. ^ Kuper, Simon (17 January 2014). "Interview: Carlo Ancelotti". Financial Times. Retrieved 1 June 2018. ^ a b c d "Parma Calcio 1913 » Manager history". World Football. Retrieved 13 June 2016. ^ a b c d e Alison Ratcliffe (24 June 2015). "The Parma story: Hernan, Hristro, Gigi and the dairy dream gone wrong". FourFourTwo. Retrieved 10 June 2016. ^ a b "Parma Calcio 1913 » Fixtures & Results 1996/1997". World Football. Retrieved 13 June 2016. ^ a b c d e James Horncastle (4 May 2015). "Real Madrid vs Juventus a reminder of Carlo Ancelotti's tough time in Turin". ESPN FC. Retrieved 10 June 2016. ^ Dave Taylor (5 March 2015). "When Parma ruled Europe". Football Italia. Retrieved 10 June 2016. ^ a b "Tanzi pensa al mercato: Baggio al Parma" (in Italian). Il Corriere della Sera. 10 July 1997. Retrieved 2 May 2014. ^ a b "Ancelotti: 'Pirlo and Baggio'". Football Italia. Retrieved 2 May 2014. ^ a b "Parma Calcio 1913 » Fixtures & Results 1997/1998". World Football. Retrieved 13 June 2016. ^ a b c d Greg Lea (5 May 2015). ""A pig cannot coach. Go away, Ancelotti": Abuse, failure and dismay for Carlo at Juventus". FourFourTwo. Retrieved 10 June 2016. ^ a b "Carlo Ancelotti competition coaching record". UEFA. Retrieved 10 June 2016. ^ a b "Ancelotti si presenta:"Non farò rivoluzioni" [Ancelotti presents himself: "I won't cause revolutions"]. la Repubblica (in Italian). 9 February 1999. Retrieved 21 May 2013. ^ a b "Intertoto Cup 1999". Juventus.com. Retrieved 10 June 2016. ^ a b "Juventus Turin". kicker.de (in German). kicker. Retrieved 13 June 2016. ^ a b "Ancelotti Carlo, Gli allenatore della Juventus" (in Italian). Juworld.net. Retrieved 22 December 2015. ^ a b Valerj, Alex (7 November 2001). "Milan stoppte Ancelotti" (in German). kicker. Retrieved 13 June 2016. ^ "Serie A TIM - Spieltag / Tabelle". kicker.de (in German). kicker. Retrieved 13 June 2016. ^ a b c "AC Mailand". kicker.de (in German). kicker. Retrieved 13 June 2016. ^ "Il Milan riparte dal basso" (in Italian). Eurosport. 19 May 2008. Retrieved 10 June 2016. ^ a b Ben Gladwell (4 May 2015). "Real Madrid boss Carlo Ancelotti 'changed my career' - Andrea Pirlo". ESPN FC. Retrieved 10 June 2016. ^ a b Adam Bate (5 May 2015). "Andrea Pirlo v Carlo Ancelotti: Juve star faces his old AC Milan mentor". Sky Sports. Retrieved 10 June 2016. ^ a b "Ancelotti: 'Milan harder than Madrid'". Football Italia. 1 December 2014. Retrieved 10 June 2016. ^ a b "Shevchenko, Inzaghi bury the hatchet?". ESPN FC. 15 September 2003. Retrieved 10 June 2016. ^ a b "AC Mailand". kicker.de (in German). kicker. Retrieved 13 June 2016. ^ "Milan win Champions League shoot-out". BBC Sport. 28 May 2003. Retrieved 13 June 2016. ^ "Supercoppa, il Milan fa il bis in Europa" (in Italian). La Repubblica. Retrieved 4 February 2015. ^ "Milan dei record, festa al Meazza" (in Italian). La Gazzetta di Modena. 17 May 2004. Retrieved 11 June 2016. ^ "MILAN 1-0 ROMA, ROSSONERI CROWNED ITALIAN CHAMPIONS". A.C. Milan. 2 May 2004. Retrieved 10 June 2016. ^ Massimo De Marzi (24 December 2004). "Sheva e Milan, dominatori dell'anno Statistiche 2004: rossoneri primi per punti, vittorie, gol fatti e migliore difesa" (in Italian). L'Unità. Archived from the original on 6 August 2016. Retrieved 11 June 2016. ^ "2003, Milan ko: alla Juve va la Supercoppa italiana" (in Italian). Il Corriere dello Sport. 3 August 2003. Archived from the original on 27 July 2014. Retrieved 4 February 2015. ^ "Milan, troppi errori dal dischetto l'Intercontinentale al Boca" (in Italian). La Repubblica. Retrieved 4 February 2015. ^ a b "AC Milan » Fixtures & Results 2003/2004". World Football. Retrieved 13 June 2016. ^ "Il Milan stravince la Supercoppa italiana" (in Italian). Il Corriere della Sera. 21 August 2001. Retrieved 22 January 2016. ^ "Ancelotti shattered after defeat". BBC Sport. 25 May 2005. Retrieved 10 June 2016. ^ a b "AC Milan » Fixtures & Results 2004/2005". World Football. Retrieved 13 June 2016. ^ "2005-06 UEFA Champions League" (in Italian). UEFA. Retrieved 3 February 2015. ^ a b "Filippo Inzaghi". FourFourTwo. 9 January 2008. Retrieved 10 June 2016. ^ "Punishments cut for Italian clubs". BBC Sport. 26 July 2006. Retrieved 13 June 2016. ^ Alex O'Henley (20 February 2007). "Vennegoor of Hesselink's vow". UEFA.com. Retrieved 13 June 2016. ^ "2006/07: Milan avenge Liverpool defeat". UEFA.com. 23 May 2007. Retrieved 10 June 2016. ^ "2007: Milan overcome sombre Sevilla". UEFA.com. Retrieved 7 July 2015. ^ Mark Ogden (1 June 2009). "Chelsea manager Carlo Ancelotti: Profile". The Telegraph. Retrieved 27 April 2016. ^ a b "AC Milan". UEFA.com. Retrieved 27 April 2016. ^ "Coppa Italia, il Catania elimina il Milan Totti 200 volte in gol e la Roma va" (in Italian). La Repubblica. 16 January 2008. Retrieved 27 April 2016. ^ Riccardo Pratesi (3 December 2008). "La Lazio caccia fuori il Milan" (in Italian). La Gazzetta dello Sport. Retrieved 27 April 2016. ^ a b "Ancelotti appointed Chelsea boss". BBC Sport. 1 June 2009. Retrieved 20 December 2015. ^ Burt, Jason (19 May 2009). "Carlo Ancelotti lines up English lessons for Chelsea job". The Daily Telegraph. Retrieved 20 December 2015. ^ a b "Chelsea FC | Fixtures & Results 2009/2010". World Football. Retrieved 13 June 2016. ^ Stevenson, Jonathan (22 February 2010). "Jose Mourinho reaches crossroads at Inter Milan". BBC Sport. Retrieved 20 December 2015. ^ Dawkes, Phil (24 February 2010). "Inter Milan 2 - 1 Chelsea". BBC Sport. Retrieved 20 December 2015. ^ McNulty, Phil (16 March 2010). "Chelsea 0 - 1 Inter Milan (agg 1 - 3)". BBC Sport. Retrieved 20 December 2015. ^ "Barclays Premier League - Spieltag / Tabelle". kicker.de (in German). kicker. Retrieved 13 June 2016. ^ McNulty, Phil (9 May 2010). "Chelsea 8 – 0 Wigan". Stamford Bridge, London: BBC Sport. Retrieved 10 May 2010. ^ "Chelsea break records to win title". ESPN Soccernet. 9 May 2010. Archived from the original on 22 June 2011. Retrieved 10 May 2010. ^ "Ancelotti, primo scudetto inglese". Il Messaggero (in Italian). 9 May 2010. Archived from the original on 2 August 2012. Retrieved 14 May 2010. ^ a b "Chelsea FC | Fixtures & Results 2010/2011". World Football. Retrieved 13 June 2016. ^ Burt, Jason (5 January 2011). "Wolverhampton Wanderers 1 Chelsea 0". Daily Telegraph. Retrieved 20 December 2015. ^ Burt, Jason (5 January 2011). "Carlo Ancelotti keen to remain at Chelsea despite club's current run of poor results". Daily Telegraph. Retrieved 20 December 2015. ^ McNulty, Phil (8 May 2011). "Man Utd 2 - 1 Chelsea". BBC Sport. Retrieved 20 December 2015. ^ a b "Carlo Ancelotti is sacked as Chelsea manager". BBC Sport. 22 May 2011. Retrieved 22 May 2011. ^ a b Pereira, Alexis (20 March 2012). "Le Top 10 des entraîneurs les mieux payés du monde". Foot Mercato (in French). Retrieved 20 December 2015. ^ a b "Carlo Ancelotti". Soccerbase. 14 July 2012. Retrieved 22 December 2015. ^ "Jose Mourinho: Manchester United manager's record in numbers". BBC. 27 May 2016. ^ a b "Carlo Ancelotti named new manager of Paris Saint-Germain" (in German). BBC Sport. 30 December 2011. Retrieved 14 June 2016. ^ Ali, Mohammed (21 March 2012). "Paris Saint-Germain 1–3 Lyon: Ancelotti suffers first defeat in charge of PSG". Goal.com. Retrieved 20 December 2015. ^ Bairner, Robin (31 March 2012). "Nancy 2–1 Paris Saint-Germain: Mollo strikes late as Ancelotti's side suffers title setback". Goal.com. Retrieved 20 December 2015. ^ "Ligue 1 - Spieltag / Tabelle". kicker.de (in German). kicker. Retrieved 13 June 2016. ^ a b c "Paris Saint-Germain » Fixtures & Results 2011/2012". World Football. Retrieved 13 June 2016. ^ Brassell, Andy (12 May 2013). "David Beckham's Paris St-Germain clinch French title". BBC Sport. Retrieved 20 December 2015. ^ "PSG wrap up title". ESPN FC. 12 May 2013. Retrieved 20 December 2015. ^ Johnson, Jonathan (12 May 2013). "PSG's 19-year wait for a third title is over". Retrieved 20 December 2015. ^ a b "Paris Saint-Germain » Fixtures & Results 2012/2013". World Football. Retrieved 13 June 2016. ^ "Real Madrid target Carlo Ancelotti asks to leave PSG". BBC Sport. 19 May 2013. Retrieved 20 December 2015. 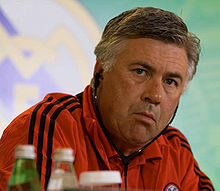 ^ "Carlo Ancelotti : New Madrid Coach". genius.com. 25 June 2013. Retrieved 25 June 2013. ^ a b c Coerts, Stefan (25 June 2013). "Official: Real Madrid confirm Ancelotti signing". Goal.com. Retrieved 20 December 2015. ^ "Gareth Bale Spurs-Real Madrid Move Confirmed". sky.com. 2 September 2013. Retrieved 20 December 2015. ^ "Real Madrid give Carlo Ancelotti winning start after Isco's dream debut". Guardian. 18 August 2013. Retrieved 19 August 2013. ^ a b Paul Wilkes (21 March 2014). "How Angel di Maria went from England-bound castaway to key man at Real Madrid". FourFourTwo. Retrieved 10 June 2016. ^ Jenson, Pete (16 April 2014). "Barcelona 1–2 Real Madrid: Gareth Bale scores stunning late winner to clinch Copa del Rey and win first trophy in Spain". Daily Mail. Retrieved 17 April 2014. ^ Borden, Sam (16 September 2014). "Real Madrid Routs Bayern Munich in Champions League". New York Times. Retrieved 29 April 2014. ^ Taylor, Daniel (24 May 2014). "Gareth Bale inspires Real Madrid's extra-time barrage to crush Atlético". The Guardian. Retrieved 24 May 2014. ^ a b "Liga BBVA - Spieltag / Tabelle". kicker.de (in German). kicker. Retrieved 13 June 2016. ^ a b "Real Madrid". kicker.de (in German). kicker. Retrieved 13 June 2016. ^ "FACTBOX-Former Real Madrid coach Carlo Ancelotti". Eurosport. 26 May 2015. Retrieved 20 December 2015. ^ "Joachim Low, Carlo Ancelotti and Diego Simeone up for coach award". 1 December 2014. Retrieved 19 January 2015. ^ a b "Ancelotti: "Pogba non verrà al Real Madrid, e Inzaghi farà rialzare il Milan"". La Gazetta dello Sport (in Italian). 19 January 2015. Retrieved 20 December 2015. ^ "Ancelotti, Meilleur entraineur en 2014". topmercato.com (in French). 21 January 2015. Retrieved 20 December 2015. ^ "Liga BBVA - Spieltag / Tabelle". kicker.de (in German). kicker. Retrieved 13 June 2016. ^ a b "Real Madrid » Fixtures & Results 2014/2015". World Football. Retrieved 13 June 2016. ^ "Florentino Pérez holds a press conference". Real Madrid. 25 May 2015. Retrieved 20 December 2015. ^ a b "Real Madrid sack Carlo Ancelotti; Rafael Benitez tipped to take over". BBC Sport. 25 May 2015. Retrieved 25 May 2015. ^ Walker, Joseph (25 May 2015). "Real Madrid part ways with Ancelotti". UEFA.com. Retrieved 20 December 2015. ^ "AC Milan: Carlo Ancelotti decides against San Siro return". BBC Sport. 2 June 2015. Retrieved 2 June 2015. ^ Hay, Anthony (14 August 2015). "Former Real Madrid boss Carlo Ancelotti isn't fishing for new job... but does manage to catch a salmon in Vancouver!". Daily Mail. Retrieved 20 December 2015. ^ "Pep Guardiola to leave Bayern Munich at end of the season". BBC Sport. 20 December 2015. Retrieved 20 December 2015. ^ a b c "Bayern München". kicker.de (in German). kicker. Retrieved 9 July 2016. ^ "Heißer Trainingsstart unter Ancelotti" (in German). Süddeutsche Zeitung. 11 July 2016. Retrieved 21 July 2016. ^ "Arjen Robben hurt as Bayern begin with win; Dortmund and Wolfsburg lose". ESPN FC. ESPN. 16 July 2016. Retrieved 21 July 2016. ^ "Bayern Munich 1-0 Man City: Pep Guardiola loses first friendly". BBC Sport. 20 July 2016. Retrieved 21 July 2016. ^ "Bayern Munich announce U.S. tour for International Champions Cup". ESPN FC. 22 March 2016. Retrieved 10 August 2016. ^ "FC Bayern unterliegt Milan im Elfmeterschießen" (in German). kicker. 28 July 2016. Retrieved 10 August 2016. ^ "Green-Gala in Charlotte: Bayern deklassiert Inter" (in German). kicker. 31 July 2016. Retrieved 10 August 2016. ^ "Bayern unterliegt Real Madrid - Ulreich unglücklich" (in German). kicker. 4 August 2016. Retrieved 10 August 2016. ^ a b "Bayern München » Fixtures & Results 2016/2017". World Football. Retrieved 18 August 2016. ^ a b c "Im zweiten Anlauf: Vidal beschert Bayern den ersten Titel" (in German). kicker. 14 August 2016. Retrieved 14 August 2016. ^ a b "Bayern führt Werder zum Auftakt vor" (in German). kicker. Retrieved 27 August 2016. ^ "Lewandowski-Hattrick schickt Bayern in Runde 2" (in German). kicker. Retrieved 29 October 2016. ^ a b c d e f g h "Bayern München". kicker.de (in German). kicker. Retrieved 29 October 2016. ^ "Ferreira-Carrasco schießt Atletico zum Sieg" (in German). kicker. Retrieved 29 October 2016. ^ a b Mark Lovell (29 April 2017). "Carlo Ancelotti has 'big regrets' over Bayern's exits, despite Bundesliga title". ESPN FC. Retrieved 29 April 2017. ^ "Real Madrid vs. Bayern Munich: How a Referee Can Ruin a Fantastic Tie". The Real Champs. 19 April 2017. Retrieved 11 June 2017. ^ "Bayern München 2 - 3 Borussia Dortmund Match report - 4/26/17 DFB Pokal - Goal.com". www.goal.com. Retrieved 11 June 2017. ^ a b "Bayern Munich beat Dortmund on penalties to retain Supercup". Bundesliga. Deutsche Fußball Liga. 5 August 2017. Retrieved 5 August 2017. ^ a b "Carlo Ancelotti: Bayern Munich sack Italian manager". BBC Sport. 28 September 2017. Retrieved 28 September 2017. ^ "Carlo Ancelotti sacked: Tactics trouble and player power rule at Bayern". espn.com. Retrieved 1 July 2018. ^ "Official: Napoli appoint Ancelotti". Football Italia. 23 May 2018. ^ a b "Napoli hire Carlo Ancelotti to replace Maurizio Sarri as manager". ESPN. PA Sport. 23 May 2018. Retrieved 23 May 2018. ^ "Lazio 1-2 Napoli: Runners-up fight back for important win". Sky Sports. Retrieved 25 August 2018. ^ a b c Gabriele Marcotti (25 January 2017). "Carlo Ancelotti talks Bayern, Ronaldo, player egos and ... bears". ESPN FC. Retrieved 12 May 2017. ^ a b c GIANNI MURA (19 March 2009). "Ancelotti a cuore aperto "E non dite che sono buono"" (in Italian). La Repubblica. Retrieved 12 May 2017. ^ "Carlo Ancelotti si confessa: "Mai avuto feeling con la città"" (in Italian). La Repubblica. 19 March 2009. Retrieved 12 May 2017. ^ Christian Giordano (13 August 2008). "Da Tardelli a Desailly, cambiare serve". repubblica.it (in Italian). La Repubblica. Retrieved 3 February 2015. ^ Enrico Currò (7 February 2005). "Shevchenko e Crespo San Siro tra brividi e gioia" (in Italian). La Repubblica. Retrieved 12 May 2017. ^ "Cafu è l' attaccante aggiunto Rui Costa e Tomasson in ombra" (in Italian). La Repubblica. 1 March 2004. Retrieved 12 May 2017. ^ "Coppa Italia, Milan-Chievo pareggio a reti inviolate" (in Italian). La Repubblica. 14 January 2003. Retrieved 12 May 2017. ^ "Milan, bene un tempo, ma non segna e Dida, nel finale, lo salva dai francesi" (in Italian). La Repubblica. 26 September 2006. Retrieved 12 May 2017. ^ "La Juve travolge il Milan grinta, vittoria e sorpasso" (in Italian). La Repubblica. 10 November 2002. Retrieved 12 May 2017. ^ Enrico Currò (12 April 2003). "La forza di capitan Maldini "Non sarà l'anno dei rimpianti"" (in Italian). La Repubblica. Retrieved 12 May 2017. ^ a b Marco Ercole (25 October 2016). "Real Madrid, Ancelotti: "A Ronaldo lasciavo scegliere dove giocare"" (in Italian). FoxSports.it. Retrieved 12 May 2017. ^ a b Richard Williams (27 May 2016). "Carlo Ancelotti: the arch firefighter who always pays his way". The Guardian. Retrieved 12 May 2017. ^ "Carlo Nesti: Ancelotti finto buono" (in Italian). TuttoMercatoWeb.com. 26 September 2006. Retrieved 12 May 2017. ^ "Ancelotti, che feeling con Ribery: "Per me lui è come una Ferrari"" (in Italian). FoxSports.it. 4 April 2017. Retrieved 12 May 2017. ^ Piers Edwards (10 October 2016). "Carlo Ancelotti: Football's 'Diva Whisperer' learns from 'The Godfather'". CNN.com. Retrieved 12 May 2017. ^ "Thiago reveling in Bayern freedom under Ancelotti". FourFourTwo. 11 April 2017. Retrieved 12 May 2017. ^ a b "Carlo e Luisa, c'eravamo tanto amati". Gazzetta di Reggio (in Italian). 24 October 2008. Archived from the original on 18 February 2013. Retrieved 2 June 2009. ^ Saltalamacchia, Stefania (8 July 2014). "Carlo Ancelotti si è sposato". vanityfair.it (in Italian). Vanity Fair. Retrieved 21 December 2015. ^ "Carlo Ancelotti younger girlfriend Marina". FabWags. March 2013. Retrieved 21 December 2015. ^ "Carlo Ancelotti sposa la "donna del mistero"" [Carlo Ancelotti marries his "mystery woman"] (in Italian). Eurosport. 8 July 2014. Archived from the original on 8 August 2016. Retrieved 10 June 2016. ^ "Ancelotti contro Mourinho "E se il Milan vuole resto". La Gazzetta dello Sport (in Italian). 26 May 2009. Retrieved 2 June 2009. ^ "Ancelotti keeps Chelsea focus despite father's illness". ESPN FC. 18 September 2011. Retrieved 21 December 2015. ^ "Carlo Ancelotti to attend Chelsea v Arsenal despite father's death". The Guardian. 30 September 2010. Retrieved 14 May 2013. ^ "Napoli, Ancelotti nonno: ecco i gemelli di Davide". gazzetta.it. Retrieved 31 January 2019. ^ "Carlo Ancelotti". Football Database.eu. Retrieved 21 December 2015. ^ "Ancelotti's league Stats". Lega Serie A. Archived from the original on 11 January 2014. Retrieved 10 May 2013. ^ Di Maggio, Roberto (28 November 2002). "Carlo Ancelotti – Appearances in International matches". RSSSF. Retrieved 21 December 2015. ^ "Carlo Ancelotti". EU-Football.info. Retrieved 7 May 2013. ^ "AC Milan » Fixtures & Results 2007/2008". World Football. Retrieved 13 June 2016. ^ "AC Mailand". kicker.de (in German). kicker. Retrieved 13 June 2016. ^ a b c "Carlo Ancelotti". Eurosport. Retrieved 20 December 2015. ^ a b c d e "C. Ancelotti". Soccerway. Retrieved 20 December 2015. ^ a b "Manager profile: Carlo Ancelotti". Premier League. Retrieved 19 September 2018. ^ "Albo "Panchina d'Oro"" (in Italian). 1 February 2010. Archived from the original on 7 July 2011. Retrieved 21 December 2015. ^ Garin, Erik (2 August 2007). "IFFHS' World's Best Coaches of the Year 1996-2006". RSSSF. Retrieved 21 December 2015. ^ Rainbow, Jamie (14 December 2012). "World Soccer Awards – previous winners". World Soccer.com. Archived from the original on 29 June 2016. Retrieved 21 December 2015. ^ a b "Wall of Fame". Globe Soccer.com. Retrieved 28 December 2015. ^ "Ad Ancelotti il 'Premio Bearzot'. Il 27 maggio la cerimonia di consegna" (in Italian). figc.it. 13 March 2014. Archived from the original on 16 April 2016. Retrieved 25 April 2016. ^ Bretland, Elliott (12 January 2015). "Joachim Low scoops FIFA World Coach of the Year award ahead of Carlo Ancelotti and Diego Simeone at Ballon d'Or ceremony". Daily Mail. Retrieved 21 December 2015. ^ "Hall of Fame 2014: Ghiggia, Ancelotti, Voeller and Candela inducted". A.S. Roma. Archived from the original on 19 February 2015. Retrieved 10 February 2015. ^ "Onoreficenze". quirinale.it (in Italian). 30 September 1991. Archived from the original on 20 March 2015. Retrieved 19 March 2015. ^ "Onoreficenze". quirinale.it (in Italian). 2 June 2014. Retrieved 21 December 2015. Wikimedia Commons has media related to Carlo Ancelotti. "Carlo Ancelotti competition coaching record". UEFA.